The Universalis program on the Mac. If you are going to be using your e-book on an e-book reader, you need some way of connecting your e-book reader to your Mac. Usually this is a USB cable. You only need to do this once, the first time you use Universalis. Universalis gives you various local calendars, for various parts of the world. If you haven't already done so, you should tell Universalis which calendar you want. In Preferences, look at the Calendars tab and make sure that you have selected the local calendar that you want. Universalis gives you a choice of translations, so choose the ones you want (if you haven't already done so in the past). 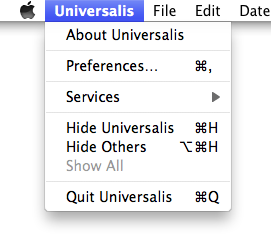 To do this, use the Translations tab of Preferences. A window will appear, asking you what e-book format you want: choose ePub, not Kindle. On successive pages, it will ask you what dates you want to cover in your e-book, and what pages you want for each day. Finally, Universalis will create the e-book you have asked for. How long the creation takes depends on the size of the e-book, but it shouldn't take more than half a minute or so. The final step is to transfer the file to your e-book reader. Each e-book reader is different. But your device will have come with instructions for transferring e-book files to it from your Mac. Start by pressing "Save to Desktop". 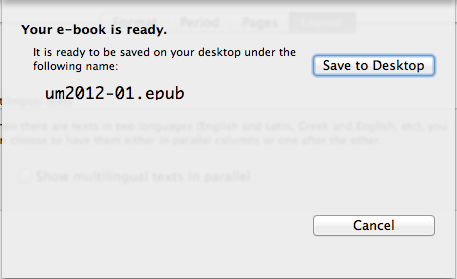 This will move the newly-created e-book file onto your desktop, where you'll be able to find it easily. Follow the instructions that came with your device. Often these will involve plugging your device into your Mac and dragging the e-book file from your desktop to your device. But do read the instructions, because often you have to aim for a specific folder in the device and sometimes there are steps you need to take after you have dragged the file. Finally, you can delete the copy of the e-book that is sitting on your desktop, because you don't need it any more.